Spotlight movie's set designer William Cheng talks how he perfectly replicated the Boston Globe building. The vast majority of Spotlight was actually filmed on set in Toronto. Cheng is a master of detail—he also worked on Guillermo del Toro’s Crimson Peak, which features one of the most intricate haunted houses in movie history. Cheng spoke with Slate about how he, his co-set designer John MacNeil, and their team perfectly re-created the Boston Globe building hundreds of miles from Boston proper. How much of Spotlight was filmed on set and how much was filmed in the Boston Globe building itself? I would say 90 to 95 percent of it was filmed on set. We built the entire newsroom, with the bullpen and the meeting rooms and the reception area. If you look at the call sheets, we only had about four shootings days Boston, and everything else was done in Toronto. Wow. Where did you find the space for that? We lucked out because there was an old abandoned Sears warehouse that they were going to tear down, so we were able to get inside and basically re-do the entire interior. The warehouse was done in the ’50s, but it had the right architectural language. We gutted everything, but it had these ribbon strip windows all around the exterior, so we built the offices coming in from the inside of the windows. 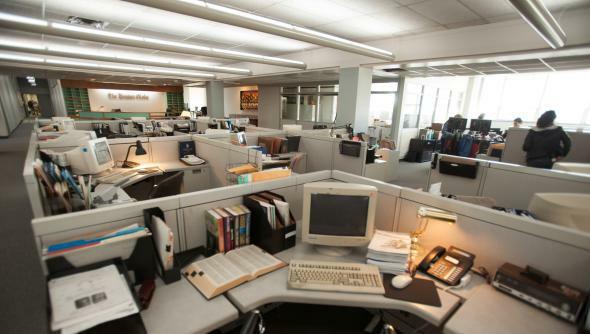 All the main characters’ offices, as well as the big bullpen newsroom area, were newly built. 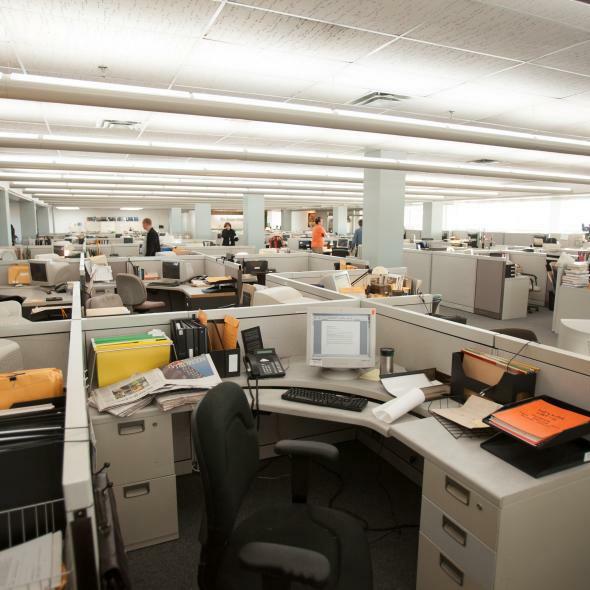 Spotlight set designers reconstructed the Boston Globe offices in a vacant warehouse. Did you just work from photos of the real Globe offices? Stephen Carter, our production designer, went to Boston with our production staff. He photographed a lot of the details that we needed, and there was also a lot of research done here through photographs and archives because even now the Boston Globe building doesn’t look exactly the way it looked 15 years ago. Stephen also had a great handle on the color palette, which helped a lot. What was the hardest detail to nail? The lighting. The light fixtures are fairly unique—kind of aluminum tubes six or seven inches in diameter—and the top half is translucent acrylic. They’re very finished pieces of furniture hung by aircraft cables from the top. They shoot light up onto the ceiling and then the light bounces back down to create a soft, even glow as opposed to the harsh light you get from normal fluorescent tubes. So we had to get those custom made. The ceilings of the Globe building were too high for anybody to measure, so we had to guestimate from photos and construct the lighting to make it work within our pattern. Our room wasn’t the same shape or the same size as the Globe bullpen, so we had to carefully count how many lights are between columns in the Globe building and replicate that. They would go to the real location at the Globe, the actors would open the door and walk in, and then the camera would cut and we’d pick them up on the inside of our set walking through a set of doors. So we’d match the doors, but that’s all. Aside from the size and shape, are there any other notable differences between your Globe building and the actual Globe building? The layout we built is actually quite different than the actual Globe building’s layout. We had to make our Boston Globe fit into an existing building, so the shape wasn’t the same and the number of seats wasn’t exactly the same, but generally through the furnishing, the colors, and the materials, we wanted to try to evoke as much of that era as we could, even though the actual layout was a little bit different. We also didn’t have as high of ceilings as the original Globe location, but nobody’s going to be a real expert on the Globe building, right? Given that very few people are indeed experts on this subject, why was it so important for you to get the details right? The authenticity helps the actors a lot—it gives them a sense of believability and makes it easier for them to concentrate on their performance instead of having to suspend disbelief. All the computers and fax machines and photocopiers had to be from circa 2001. Was it difficult to get ahold of technology from 2001? It was very difficult. All the computers and fax machines and photocopiers had to be from the 2001 era. There was even a graphics playback section that had to find Word Perfect 3.0 from 2001 and VisiCalc instead of Excel, which everyone uses nowadays. They found old screen grabs and looped them so that as the camera passes by it looks like people are actually working instead of sitting in front of blank screens. It’s mostly set designers who fetishize that kind of stuff. Most people don’t think about it, but if it works out you shouldn’t really notice it—it just goes to support the story and the actors. So if we do our jobs well, hopefully you guys don’t even know we did our jobs.